Hi children, one more old moral story for your all about a fox which could not get its food. Yes, it is the story of sour grapes. Once upon a time a fox was feeling very hungry. So it went in search of food from one place to the other. Finally it came across a vineyard. There were many bunches of grapes hanging down in the yard. 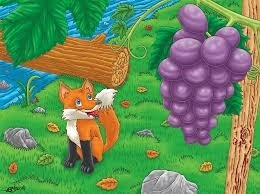 The fox's mouth started watering on seeing the bunches of grapes. The fox wanted to eat the grapes, so it jumped up to reach a bunch of grapes. But, alas!, it could reach the bunch. It jumped and jumped and tried to reach the bunch. But it could not reach the hanging bunch of grapes. The disappointed fox went to another hanging bunch and tried to reach it. But it could not reach this bunch as well. The hungry fox tried and tried and tried with each of the hanging bunch of grapes but could not succeed in reaching any of the bunch. Finally, the fox gave up its trial of jumping to reach the grapes. It walked away saying, "I am sure, these grapes are sour. So, god did not give these fruits to me to eat", thought the hungry fox. Saying so he left the vineyard. This reflects the positive attitude of the fox. When you do not get something that you want, do not cry for getting the thing. Instead develop a positive thinking like the fox and say yourself that it could be harmful for you, so go has not given you the thing you want. Moral of the story: Develop a positive bent of mind and do not yearn for what you don't get.